In Part 1 I suggested green-lighting renewables, a ‘demand side’ suggestion. Here’s a supply-side suggestion. There’s something very big that’s not going to be on the table at the Paris climate talks but which cries out for action, and that’s a political mechanism to get rid of fossil fuels. In the process of talking armed groups down from conflict, as in Northern Ireland and in the Basque region of Spain, politicians and combatants spoke delicately of ‘putting arms beyond use’. In the long running process by which the world stepped back from the brink of nuclear armagedon in the Cold War, negotiators in SALT, START and the CTBT traded and talked away some of the ‘nuclear stockpile’. Terrifying as the prospect of nuclear war was – and I remember lying in bed in London and hearing my parents talking about the Cuban Missile Crisis and asking why they hoped ‘Kennedy’ might save us – the lines of responsibility were clear. Mad or not, M.A.D. had a relatively straightforward logic and power was concentrated in a very few hands, whose fingers were available for ‘the buttons’. So far that form of M.A.D. hasn’t happened but climate change is happening, and a host of politicians are still pushing the buttons. Yet we have no equivalent process to reduce the carbon stockpile, no political process to set aside fossil fuel reserves, to stop turning geological carbon ‘resources’ into reserves with an economic value once ready to be burnt, no trade-off structure, no exercise of diplomacy, no political action to match the social imperative of avoiding catastrophic levels of climate change. It’s something of a shortcoming and one that should worry anyone participating in the forthcoming Paris climate summit. We know what the problem is: primarily we need to stop using fossil fuels. Legions (and now generations) of officials, diplomats, NGOs, scientists and politicians have laboured mightily at the United Nations Framework Convention on Climate Change (UNFCCC). But the mechanisms they have invested such effort in, bear hardly at all on the critical machinery of fossil energy systems, and not at all on the stockpile issues of carbon resources and reserves. Negotiations are conducted about ‘commitments’ to reduce emissions, or proxies for emissions but not about the energy generation systems. There is nothing that requires countries to commit to forgo the development of carbon resources, nor any mechanisms to compensate them for doing so or incentivise them to do so, beyond a vague background hope that market forces will solve that problem for us, as renewables become cheaper and cheaper. That is indeed the trend: renewables are spreading fast and fossil fuel stocks are tumbling which is great. But as in dozens of other cases, unless the problem is bounded and controls are inclusive as in the Montreal Protocol (on ozone depleting chemicals), global disaster can still follow. Even France, Britain and Germany are still burning large amounts of (ever cheaper) coal, and there is nothing to stop poorer countries from doing so. The fossil fuel system needs to be dismantled and stood down but the UNFCCC has no tools to do so. The time has come to change this and Paris is an opportune moment. We need an alternative, additional political process which deals directly with energy systems (eg commitments to convert to renewables) and the set-aside of carbon reserves and resources. Trying to move the flotilla of world economies towards a fossil free future by using the UN Framework Convention on Climate Change, is like trying to row a boat with an egg whisk. There is splashing but no meaningful traction. Governments will need to start this process for real but they are both distracted and fixated on the UNFCCC as the climate mechanism, despite the obvious truth that it is not capable of delivering. The scientific community’s contribution is led by the climatologists who by historic serendipity are built into the UNFCCC woodwork (via the Inter-governmental Panel on Climate Change). NGOs and media amplify the ‘circus effect’ of the Conferences of Parties because … because they are there. They provide almost all the very rare moments when global media and political attention focuses on ‘climate’. If the UNFCCC enjoys such pre-eminence and yet is not able to deliver, what psychology can explain this ? Is it planning fallacy, a belief that the UNFCCC will deliver in time when it plainly won’t ? Is it lock-in and the commitment effect ? Is it sunk-cost bias in which people, especially those who feel responsible, are overly optimistic about their investment reaping dividends ? Or group-think ? Or maybe none of these things but a monster version of the bystander effect, in which those involved in the UNFCCC realise that it’s not going to do the job but all assume ‘someone else’ will do what’s necessary ? Whatever the reasons, it seems that it falls to ‘civil society’, if anyone is to do so, to blow the whistle and point out that the emperor has no clothes. The problem of ‘unburnable carbon’, that there’s too much available for the atmosphere to cope with, has been known for a long time. In 1997 Dr Bill Hare of Greenpeace International published a report about it called the ‘The Carbon Logic’, drawing on work done by the Stockholm Environment Institute dating back to 1990. 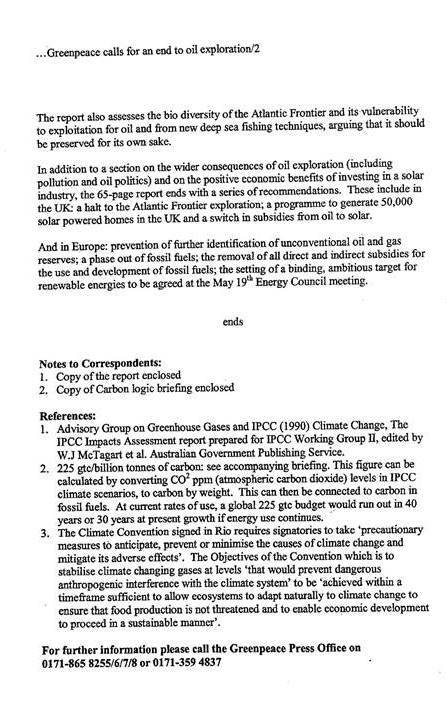 I was Programme Director of Greenpeace UK at the time and asked Bill to do that because we were launching a campaign (Atlantic Frontier Campaign) on grounds of the Carbon Logic, to try and stop further licensing of oil reserves by the UK Government. That was nearly two decades ago. 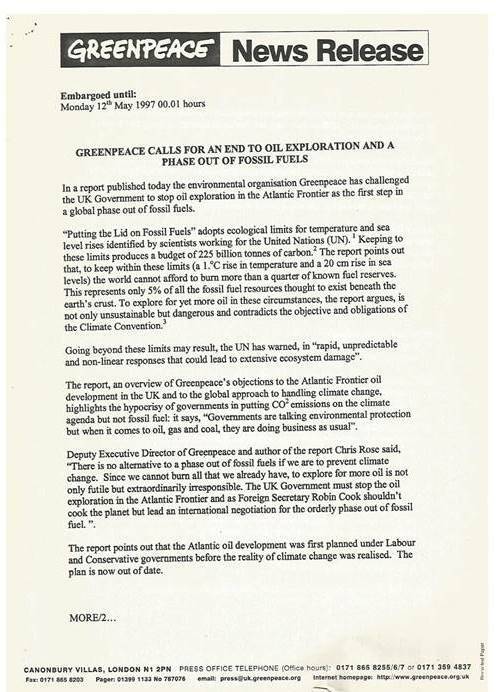 We had the attention of the oil industry, following the 1995 Brent Spar campaign, through which public opinion forced Shell into reverse on ‘decommissioning’ policy for redundant oil facilities. It was a huge thing for corporate-public politics but a relatively minor issue compared to oil development, as ‘reserves’ are the market lifeblood of oil companies. 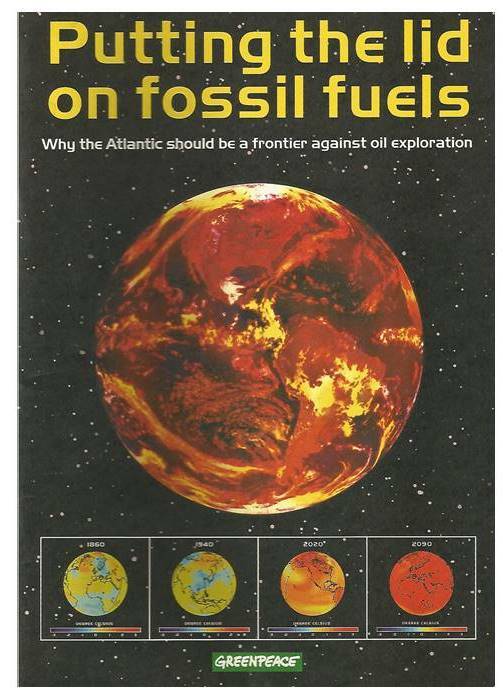 On May 12th 1997 we (Greenpeace UK) published a report Putting The Lid on Fossil Fuels: Why the Atlantic Should be a Frontier Against Oil Exploration. It called for a phase-out of fossil fuels. Hare’s analysis showed that we could only burn 5% of fossil fuels thought to exist below ground, and only 25% of known reserves, and stay within safe climate limits. Putting The Lid on Fossil Fuels began with a quote from a British politician, Dennis Healey: “When in a hole: first, stop digging”. It stated ‘Only political action will check the expansion and begin a phaseout of fossil fuels’, and called for the June 1997 UN General Assembly Special Session on the environment, and the Kyoto climate ‘summit’ in December 1997, to focus on setting a carbon budget. Of course governments were also well aware of the reality. I was later told that the IPCC had even prepared a chapter on the ‘carbon issue’ for one of its reports but it had to be shelved when a very large country with a very large amount of coal, had objected. The Atlantic Frontier Campaign failed to stop the oil development although it did increase EU protection of undersea habitats in the region, and put ‘fossil fuels’ and oil companies into the frame of the climate debate*. It also exerted leverage on both Shell and BP who invested more heavily in renewables, which was part of the intention (by 2013 both had again abandoned renewable energy). 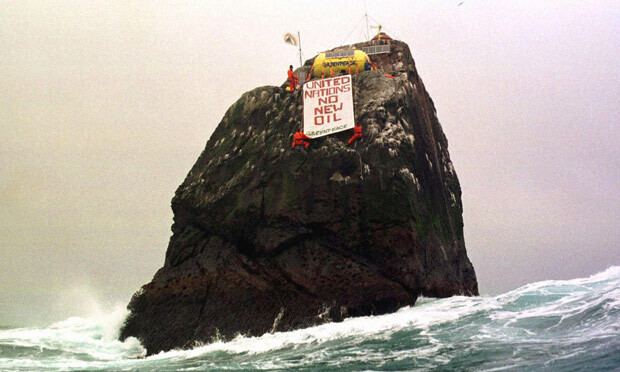 We blocked seismic testing and exploratory mobile drilling rigs, and in retaliation, and at the UK Government’s suggestion, BP tried to freeze our assets (as the Indian government is now doing to Greenpeace) and to sue me and others for millions of dollars. All this is ancient history, not much of it is online so I have posted some extracts from a book that deals with some if it here and a 1999 presentation to the Royal Institute for International Affairs which briefly explains the strategy, if you are interested. Greenpeace has doggedly continued to oppose oil development in areas such as the Arctic ever since. More recently, a series of other campaigns (eg 350, Keep it in the Ground) have taken up the ‘logic’, calling for carbon to ‘stay in the ground’. What didn’t happen was any concerted attempt to create a new political mechanism for negotiating away the carbon stockpile. ‘… logic dictates an end to fossil fuels. They will not ‘run out’ – they will have to be closed down. Given the size of the oil, coal and gas industry, it is clear that governments have never before had to face such a task and are not giving it serious consideration’. Even in Greenpeace not everyone agreed with me that we should take the Carbon Logic into the politics of the UN. Down at that ‘coalface’, my colleagues were engaged in a pitched battle over the Kyoto Protocol which had been signed in December 1997 but did not attract enough signatories to come into force until 2002 (it did not actually come into effect until 2005). Huge campaigning efforts were needed every step of the way so I don’t blame them for maybe seeing it as a distraction but unfortunately no-one else tried to turn the Carbon Logic into political action either. How might this be done ? Obviously not without difficulty. The aims of the Climate Convention could, conceivably, be used to provide high level ‘cover’ for Protocol or other legal initiative. This enables you to relate rates of warming to ‘carbon’ concentrations in the atmosphere and hence to allowable carbon budgets. So in theory Parties might adopt a new ‘Protocol’ about carbon reserves and resources but the politics of the Convention have proved glutinous at best. Negotiating away the carbon stockpile is less a legal problem and more a diplomatic and political one. On the political side it requires individuals and countries with vision, prepared to act on that vision. Just as Herman Scheer did on solar in Germany in 1998 and the government of Sweden did on the environment in 1972. But campaigns need not start by trying to thread a hugely controversial proposal through the sticky workings of the Climate Convention. Campaigners could catalyze change by finding the first country prepared to lock away carbon reserves and resources underground, forever. Grass roots campaigners could start it with the first community prepared to do the same, if they can find one with any real control of its own resources. Or even a very rich individual. Such precedents usually precede any hope of ‘higher level’ action but the UNFCCC should at least be made to acknowledge the need for such action. 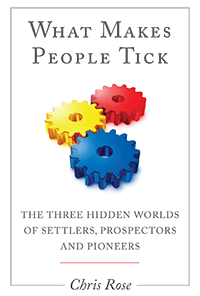 And of course campaigners, better than governments, could use their social and cultural reach to engage concerned ‘culture makers’ who are always of huge interest to politicians. For the renewables industry and investors, it would finally send the signal that we are starting the end game on climate and closing the fossil fuel era. For diplomats it could be the challenge of a lifetime. * At the time, the term ‘fossil fuels’ was almost entirely missing from the debates on the ‘climate issue’. This had a lot to do with the Global Climate Coalition, a front group for the oil, coal and gas industry. They were present at the climate talks, whereas the companies themselves were usually nowhere to be seen. The GCC’s work was mainly to keep the words ‘oil’, ‘coal’ and ‘gas’, or ‘fossil fuels’ out of Convention discussions. If you listened to them they made it sound like “the problem” was the Convention, as if climate change emanated from disagreement rather than from burning fossil fuels. This was ‘the issue’: a problem of political disagreement, not a problem of chosing which energy source to use, or of pollution.